So you want to install a plugin on your Discourse instance? Great, let’s get started! 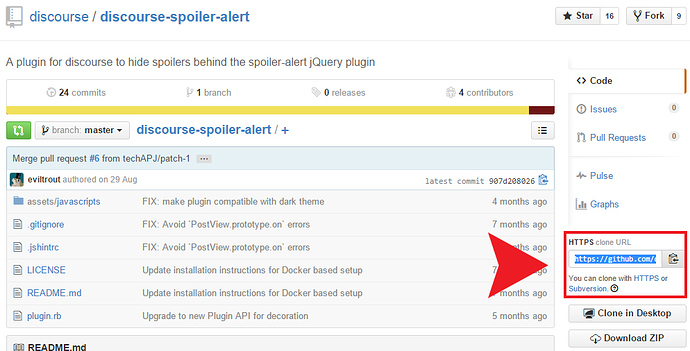 In this tutorial, we’ll install Discourse Spoiler Alert plugin. Get the plugin’s GitHub or Bitbucket git clone url. That’s it, you’ve successfully installed the Discourse Spoiler Alert plugin on your Discourse instance! This way you can install your plugin in the same space as any other and you don’t need to create an ssh key. Site maintenance mode during rebuilds? How to create a new plugins? How do I stop human spammers? Has anyone built something for informal status updates - Chat? How do you spoiler an image or onebox? Should all plugins be cloned as the `discourse` user? How do i install plugins after doing a fork? Migrate from Digital Ocean to OVH? Does this software allow admin to put Adsense ads in? Can I access Discourse forum Database to use for PowerBI reporting? Can't able to install plugins, whats the problem? Any options for over-riding the username restrictions? How to clone private repo in container via app.yml? How to enable [code] feature in the forum? How to edit plugins code? Why do I need a block storage? How can I add new badges? Is there a way to rebuild app without letting the forum down like the Discourse Upgrading feature does? The down time for rebuilding Discourse is quite long. How to convince my university to use/install Discourse? How do I manually update Discourse and Docker image to latest? ^ @AdamCapriola showed me that stuff and I did exactly the way I ordered it and it worked for me. It may seem like an obvious order to those more familiar with it, but that’s what I needed to do it successfully the first time. Now I can do it easy peasy. Change the domain name or rename my Discourse? If you use <blockquote> blocks or, as you did above, [quote] blocks, whitespace at the beginning of the line will not be preserved and the YAML document’s meaning will change, resulting in errors. How to install a private git repository plugin? Assuming that your private git repo is hosted on GitHub, you need to add your server’s user public SSH key to GitHub repo Deploy keys (https://github.com/SecretOrg/secret-plugin/settings/keys). Your private plugin should be installed on your Discourse instance. There was no errors, but my site stopped working completely. Tried ./launcher restart app, docker restart also rebooting serve, but still error persist. Also tried removing plugin url from app.yml and again rebuilding app. Your YAML is probably invalid. Copy and paste it into an online YAML validator. I just set up the tagging plugin for several DO droplets and it worked fine. @codinghorror, thanks for reaching out. Any other pointers to solve issues. yaml can be well structured yet invalid in some cases. start from the samples, one change at a time and rebuild. How do you install a plugin with a hosted instance? With hosting, plugins are only available in the Enterprise offering, and you email team@discourse.org with info on the plugin (the URL). Issue cloning plugin from an internal server. So is there a cache of server certificates that discourse_docker is allowed to install plugins from?. Try installing updates on the host: sudo apt-get update && sudo apt-get upgrade. That should update the certificate files. Ok I can see why that would work. I had assumed that since connecting from the OS hosting the docker containers worked that it would from inside the container. So I am running into this while running ./launcher rebuild so do I need to update the docker image that is being used to setup the container. I could put that apt-get commands in to the container file before the plugin is installed but seems kludgy. Thanks for building Discourse by the way, and making it open-source. It’s a sweet piece of software.